A skittish persistence pitting meditative minimalism brimming in tentative collisions against fragile beauty infused with evaporating grooves, “The Bell,” plays with vacant space through mindful silence; dormant hand-crafted organics yielding a heightened sense of looming danger and eerie calm. 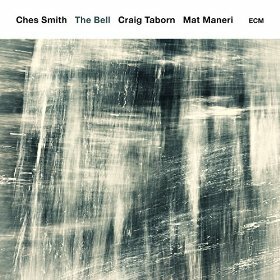 Bringing a placid mastery to the sessions, pianist Craig Taborn, violist Mat Maneri and leader, composer, drummer and vibraphonist Ches Smith exude a stellar delicacy whose suspicious decisions erupt in sumptuous rumpus and cataclysmic synergy. A cinematic assault on the senses, each player’s shady chamber-jazz improvisations drizzle, dribble and sizzle in haunted autonomy to author an art-film murder mystery packed in intense suspense and peaceful release. Ches and company play February 21st at Madison’s intimate Gates of Heaven along with the Lundberg, Packard and Pireh Trio.